Farrer Ridge ParkCare is a group of volunteers who meet once a month usually on the 1st Sunday, and work for 2 hours. We liaise with Environment ACT Parks Rangers, both on a monthly basis and for our Year Plan. Download our 2014 Year Plan here. 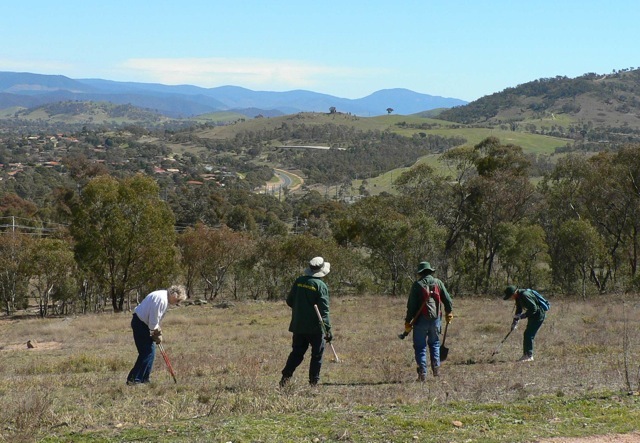 Volunteers have been working on Farrer Ridge Nature Park, since the Landcare movement started in 1989. Along with other groups we have been awarded a Community Landcare Award for our work over time. We have succeeded in removing most woody weeds, although, as they are spread into Nature Reserves by birds from nearby garden plants, we still get some Cotoneasters, Pyracanthas, Tree of Heaven, and Briar Roses. If this volunteer work had not been done, there would have been thickets of such weeds throughout the Nature Park. We removed Paterson's Curse that started to invade in the year after the 2003 bushfires, and work on removal of St John's Wort, Verbascums, and Horehound. We have received Grants to control the erosion forming on the track up Farrer Hill, by putting in Ironbark-logs, and rock steps. We also put in the Nature Trail signs, which have proved popular with the many walkers on the Ridge. We have run Guided Spring Wildflower Walks, and an Orchid Walk. After becoming aware from the Canberra Nature Park Management Plan and Implementation Plans, that Farrer Ridge has remnants of the Endangered plant association of Yellow Box-Red Gum Grassy Woodland, with lovely swathes of Kangaroo Grass, we did a Vegetation Mapping survey, with a number of overlaying maps, which have informed various work activities and projects. 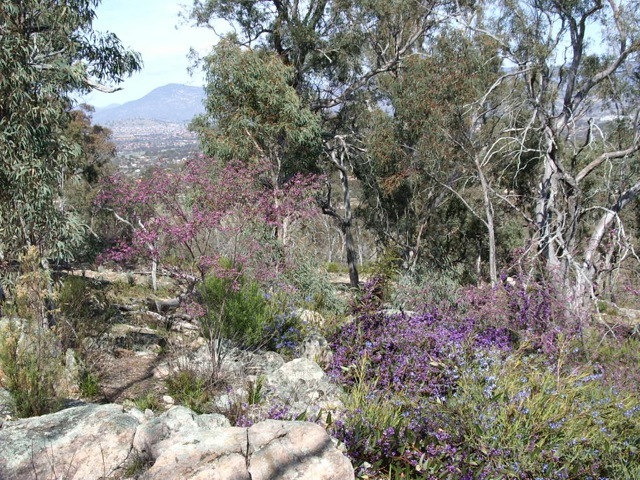 It provided a base for the Bushfire Regeneration Survey to decide 4 sites representing 4 different Vegetation ecosystems to monitor, following the severe 2003 bushfire damage. Eucalyptus melliodora trees, possibly 200-300 years old were burnt down in that terrible fire. We are aware of other rare and endangered plants that exist in the Farrer Ridge Nature Park, as well as beautiful biodiversity in the rocky outcrops. We have collected local seeds, propagated them, and planted them in the Farrer Ridge Nature Park. We have worked with School groups from Farrer Primary School, both on field excursions and in the classrooms. New members are always welcome. The group meets regularly on the first Sunday of each month, meeting at Athllon Depot. Included Biodiversity Studies by Parkcarers occurring in the Farrer Ridge Nature Park, and updating the Interpretive Sign on the Nature Trail on Farrer Hill. Bushfire Regeneration Monitoring on Farrer Ridge 2003-2008, full report can be found here.